Or go like this? 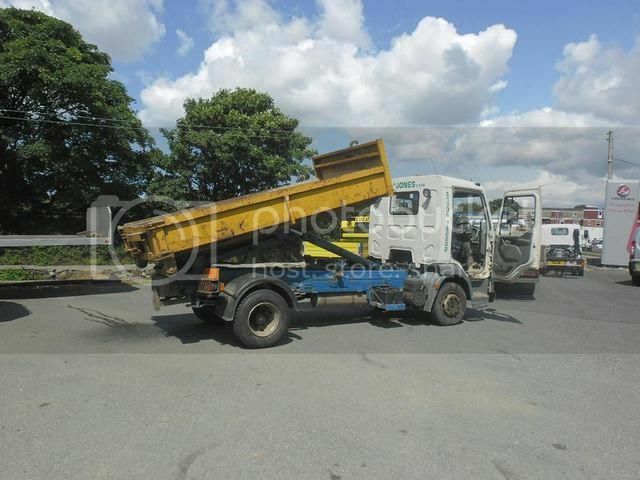 Won't sit much higher than a conventional skip lorry? I used to run a similar sort mine was a cable lifter on 18 tonner which I didn't like!! I would like to try a hook loader to see how it would compare?? It worked well on job's carting away to be honest only with a skip wagon you could take more bins at a time with you and cut's out the running back for another skip? But you would get more muck on a hook bin? And if you had multiple skips on a job you would still only be able to take one at a time to tip..
For a multi use skip on a Telescopic Gear Skip Loader you can basically make a full width (to just fit between the arms) and length (including half a metre or so overhang of the flat portion of body) skip body with barn doors just like a Hookloader skip? It would easily carry your setup and be able to be loaded to the required capacity? If you went short 6 wheeler (ex tractor unit), you could get a Hiab between the Skip Gear and Cab too? What capacity does yours carry? Nice!! Is it a 12 tonner looking at your axles?? I'll ask the same as tom what weight can you carry?? And is it a cable or hook? ?